AWStats is one of the useful web analytic reporting tool which high accuracy as it directly parses and analyzes server log files. This tutorial will install AWStats to monitor traffics to Apache web server running on Windows operating system, specifically Windows XP. 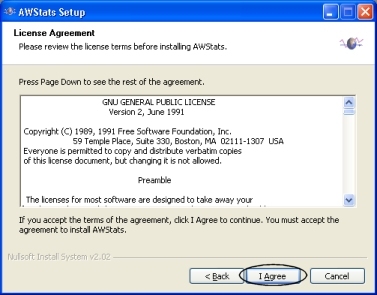 As AWStats is Perl based, a Perl Interpreter need to be installed first to take advantage of AWStats. For instruction on how to install Perl in Windows machine, check out this article. Download latest stable release of AWStats from http://www.awstats.org/. Choose the setup package that ended with .exe extension. 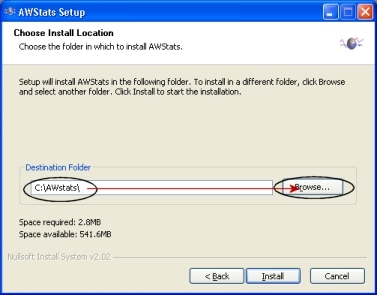 Launch the AWStats setup file by double clicking on the executable that just has been downloaded. You may want to change the installation folder here. Then click on “Install” to start the installation. A) awstats_configure.pl tries to determine your current log format from your Apache web server configuration file httpd.conf (it asks for the path if not found). If you use a common log, awstats_configure.pl will suggest changing it to the NCSA combined/XLF/ELF format (you can use your own custom log format but this predefined log format is often the best choice and makes setup easier). See the Apache manual for more information on this directive (possibly installed on your server as www.mysite.com/manual). D) awstats_configure.pl will ask you for a name for the configuration profile file. Enter an appropriate name such as that of your web server or the virtual domain to be analyzed, i.e. mysite. – For Linux/BSD/Unix users: /etc/awstats. – For Mac OS X, Windows and other operating systems: the same directory as awstats.pl (cgi-bin). Check through the httpd.conf is configured properly according to steps above. It has been reported that sometime the CustomLog is not changed from common to combined. Replace the value with “W” for analyzing web server log files, “S” for a streaming server log file, “M” for mail log files, “F” for ftp log files. C) Check if LogFormat has the value “1” (it means “NCSA apache combined/ELF/XLF log format”) or use a personalized log format if you don’t use combined log format. D) Check if SiteDomain parameter with the main domain name or the intranet web server name used to reach the web site to analyze (Example: www.mydomain.com). G) Edit ‘awstats.pl’ located in “C:\Program Files\AWStats\www\root\cgi-bin” and change the path on the first line to point to exact location of perl.exe in your system, i.e. #!C:\perl\bin\perl.exe. New version of AWStats creates alias directory entries at the bottom of Apache httpd.conf file. If you want to have just one CGI executable directory, you have to move the AWStats scripts to existing CGI directory. The following assume installation in default path. Delete from Apache web server’s httpd.conf the alias directory that has been inserted by AWStats setup program. This is to not include statistics from your own local machines, they will remain in the actual log files but excluded from awstats counts. To get actual hits and figures it’s sometime necessary, but is not essential at this stage. There are two possible way to analyze, update and generate the AWStats statistics, command line and browser based. Go to the command line, and change directory to your AWStats cgi-bin directory, i.e. C:\Program Files\AWStats\www\root\cgi-bin. Found 225521 new qualifed records. 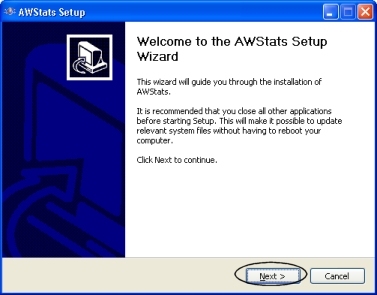 AWStats statistics can be updated from a browser, to provide real-time statistics, by clicking the “Update now” link that appears when AWStats is used as a CGI (only applicable if AllowToUpdateStatsFromBrowser is set to 1 in AWStats config file ). Again, there is 2 methods where AWStats’s statistics can be read, corresponding to the generation method of the stats mentioned above. The process may take a while, after it’s finished, a html will be generated where you can view it with a browser by double clicking on it.